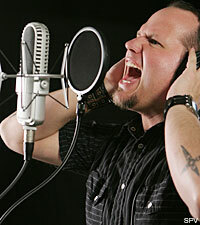 Tim "Ripper" Owens is most remembered as the uber-fan who lived the dream by stepping into the leather boots of Rob Halford in Judas Priest and having a Hollywood movie based loosely on his life in the form of 'Rock Star,' which starred Mark "Marky Mark" Wahlberg, before bowing out of Priest upon Halford's return. Owens rebounded, joining power metal mavens Iced Earth. He eventually exited when fan demand for the return of vocalist Matthew Barlow became too deafening to ignore. It's a true metal soap opera. So what has Ripper been up to in the interim? He's been playing games. "After Iced Earth, I recorded a CD with Yngwie Malmsteen and started working on my solo record, 'Play My Game,'" the vocalist told Noisecreep. "I did shows around the world with some friends, like David Ellefson, Andreas Kisser and Jimmy DeGrasso, in a band called Hail. I then toured the world with Yngwie! I love the solo thing, but there's still something special about being in a band. That's why I have Beyond Fear. Doing the solo record was great because I got to work with all these great players and bring in so many friends. There are top notch musicians on this CD. What a freaking dream come true." The guest stars on 'Play My Game' include Mr. Big's Billy Sheehan, Savatage's Chris Caffery and Nevermore's Jeff Loomis, to name a few. "This is me, and if you don't think it is, then kiss my a--," Ripper said, addressing the "s--- talkers" in the metal scene. "I'm tired of people who say you need to leave bands and do your own thing. Then when I do, they try and tell me who I am or who I should work with. I am a metal singer that has just made a killer CD that I love. If you don't, that's cool. Don't listen to it." If you make the choice to crank 'Play My Game,' you won't be disappointed.